All IBEP / CEFS archery safety classes given by Andover Archery Center are provided for FREE although we do ask for donations to help supplement expenses which are not covered by the DEEP. Classes are limited to 24 students. Andover Archery reserves several spots for their own patrons. Other spots are open to any individual to who registers on the DEEP web site earlier enough to reserve a spot. Next available classes for 2019 are Sunday May 5th and June 23rd. We expect to also hold classes in July, August and September. We do have an early notification list you can get onto simply by being an Andover Archery patron. Andover Archery patrons are guaranteed space in any classes we hold. Andover Archery feels a responsibility to our customers to provide this service on a frequent basic. We typically schedule 6 to 8 classes each year starting in the late winter and ending in the late fall. Far more than any other archery equipment provider in Connecticut. We challenge other stores who sell archery equipment to fulfill their responsibility. Mark Hall has given more than 160 classes or 1800 volunteer hours of instruction to date. 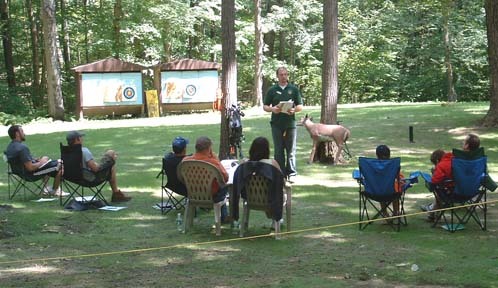 Andover Archery provides free bow hunter education classes. Class starts promptly at 8:00 a.m. and will end approximately 4:00 p.m. You should arrive 15 minutes early to complete your final registration. Don't bother showing up late. The first half hour of the class is one of the most important portions of the program. If you are unable to be here on time we would advise you to call and reschedule for the next class we offer. To register you can either call us at 860-742-4279 or email us at andoverarchery@comcast.net . Make sure to include your name, address and phone number. Weather permitting your class will spend much of the time outdoors, please dress appropriately. Bow, 5 practice arrows, and whatever else you need to shoot. Comfortable folding chair for yourself. Pen, Pencil, Paper or Note Book. Your own personal equipment is optional. ***Attention students under the age of 18. Even if you are old enough to drive to the class yourself anyone under 18 years of age will need their parent or guardian to sign their registration card. Unless you are applying for a crossbow permit everyone will be required to shoot and demonstrate your archery skills. You are not being tested for accuracy. You are being tested for safety which requires you to demonstrate you know proper archery form and technique. If you are unsure of your skills we suggest you receive help before coming. This is something that a good pro shop like Andover Archery can provide to you. Come prepared to have an enjoyable learning experience. If you don’t have your own bow you may want to borrow one from a friend. A bow and arrows will be provided for your testing if you cannot bring one. The CEFS card you will receive if you successfully complete the class is accepted in all states and many other countries requiring an archery safety class certificate. About your instructors and facility. Located on Route 316, 3 miles from Route 6 or 3 miles from the junction of Route 85 and Route 66 (Hebron Center). It is a rural area so look for our sign at the end of the driveway. If you need anything from the store it will be available to you during several breaks and immediately after the class. Your instructors are Mark Hall and son Gary Hall. Mark has been an instructor since Connecticut started classes in 1982 and holds the highest rank of Master Instructor. Gary started hunting over 10 years ago and has recently become a chief instructor.